There are hundreds of games that are just played for fun. Craps is just one of the many dice games that gamblers have enjoyed for many years. Today, thanks to technology, online craps is available to players from all over the world at the tip of their fingers. Craps is a negative expectation game, but as far as negative expectation games go, it’s a good one. If you place the right bets, you’ll face a low house edge. If you have the right personality type, you’ll probably also really enjoy the experience. What you probably haven’t found yet is a craps strategy that will overcome the house edge. The first thing to play online craps is to understand the game; then, in order to win at online craps, it’s important to know a little bit of the game’s gambling math. Craps is a game where someone rolls two dices and gets a total, so understanding the mathematical odds of achieving each of those totals is the beginning (but not the end) of craps wisdom. Everyone knows that if you roll two dices, you’ll get a total of between 2 and 12. What most people don’t know is what the odds of achieving each total are and they’re not hard to calculate. There is only one way to roll a 2 with 2 dice. They both have to land on 1. The odds of a single dice landing on 1 is 1 in 6. To get the odds of both of those dice landing on 1, you multiply the probability of one event by the other, so you get a total chance of getting a 2 of 1/36, which is what you get when you multiply 1/6 by 1/6. You could also express this as a percentage as well, 1/36 is the same thing as ~2.78%. The odds of rolling a 12 are exactly the same because you’re looking at exactly the same situation. There’s only one way to get a total of 12 when rolling two dice, and that’s for both of the dice to land on 6. So the percentage of getting a total of 12 is ~2.78%, or 1/36, or 35 to 1. The first way of rolling a total of 3 is to get a 1 on the first die and a 2 on the second die. The second is to get a 2 on the first die and a 1 on the second die. (The same logic applies to the total of 11, but we’re looking at a 5 and a 6 or a 6 and a 5.) Either way, the odds are 1/18, or ~5.56%, or 17 to 1. There are three ways to roll a total of 4 or 10. There are four ways to roll a total of 5 or 9. There are five ways to roll a total of 6 or 8. And there are six ways to roll a total of 7. Understanding the math behind a game makes the game more enjoyable. And once you understand the math behind online craps, you can start to make educated decisions about which craps bets are a good value for your gambling dollar and which ones aren’t. It doesn’t mean you’ll start winning at craps just because you understand the math, but you’ll have a better shot at it than someone who doesn’t get the arithmetic. The craps strategy online casinos use to make their money is to have payout odds that are lower than the true odds of getting a certain result. A casino can create an online craps variant that would just have payouts for each of the totals above, and if you bet on that specific total, you’d get a specific payout. They might set up the game so that any time you rolled a 7, and you’d bet on 7, you’d win 4 to 1 on your money. But the actual odds of getting that total are 5 to 1.
Who would profit in that scenario? In six rolls, on average, you’d win that bet once. You’d lose five times. If you were betting a dollar each time, you’d lose $5. On the one time you won, you’d win $4 back. Where’d the extra dollar go? That’s the casino’s edge, and they have such an edge on every game they play. Your goal, as a savvy gambler, is to try to keep that edge as low as possible. Of course, real online craps doesn’t work exactly like that. Real craps games have a whole array of bets available, and most of them aren’t as simple as just betting on a specific total. But the house edge on those bets varies widely. Players should understand the different types of craps bets. Learning more about each bet can help you make the right decisions during gameplay. Most bets in the game are pretty straightforward, but if you are new to craps, you may feel overwhelmed because there are so many wagers available. Below you can see each bet type found in the game and a short example so you are better prepared for craps online or land-based. These are the most commonly placed wagers in the game of craps. The shooter will usually have placed one of these bets before the come-out roll. Both wagers pay even money when a win occurs. The Pass Line Bet will win if the come-out roll is a 7 or an 11. The bet will lose if the roll is a 2, 3 or 12. If any other value is rolled, then a point is created at that value and the pass line wager will stay in place until the point is rolled again or a 7. The point wins and the 7 loses on the roll. The don’t pass wager wins if the come-out roll is a 2 or 3. A 7 or 11 is a loss. If a 12 is rolled, the wager is pushed and will not be a win or a loss. The wager stays on the table if a point is created and the wager is lost is the point is rolled again or won if a 7 is rolled. These two wagers are similar to the two above, the difference is that they are made after the point has been established instead of before. Be sure to understand these wagers before placing them as they can be confusing. In the first roll, after a come bet has been wagered, if a 7 or 11 is rolled, then the wager is won. A 2, 3 or 12 is a loss. Any other number creates a point for the come wager. Let’s say you roll a 4. The 4 is then the point. The wager remains until a 4 is rolled or a 7. 4 wins and a 7 loses. A don’t come bet will lose is a 7 or 11 is rolled while a 2 or 3 is a win. Another number creates a point and the wager remains. A win will be created if a 7 is rolled and a loss if the point number is rolled. The bet is paid in even money with 1 to 1 odds if won. These wagers are considered an extension of the four above bets. Odds bets include: Pass Line Odds, Don’t Pass Odds, Come Odds and Don’t Come Odds. A pass line odds wager would be placed to complement a pass line bet after a point has been created. The bet will pay if the point is rolled before a seven and lost if a seven is rolled. There is no house edge on these wagers, so you can win good money if the right numbers pop up on the roll. A 4 or 10 pays 2 to 1 odds, a 5 or 9 pays 3 to 2 odds and 6 or 8 will pay 6 to 5 odds. With a don’t pass odds wager, the bet is a complement of a don’t pass bet. If a seven is rolled before the point, the odds wager is paid. It will lose if the point is rolled first. When a 4 or 10 is rolled, the odds pay 1 to 2 while 5 or a 9 pays 2 to 3 and 6 or 8 pays 5 to 6. A Place Lose bet is pretty much the opposite of a place win bet. You are wagering on the same numbers, but you want to see a 7 rolled instead of the other numbers. A 7 gives you a win while the other numbers cause a loss. Similar to a place win bet, a buy bet is when a player uses craps strategy to wager on a specific number to be rolled before a 7. The payouts are higher, but you have to pay a 5% commission on this bet. Some casinos charge the commission on the bet while others will only take the commission on a win. A 6 or 8 chosen number will pay out 6 to 5 while a 5 or 9 will pay out 3 to 2 and a 4 or 10 will pay out 2 to 1. This bet is the opposite of a buy bet. It has a 5% commission fee as well. With a Lay Bet, you are wagering on a 7 being rolled before a specific chosen number. If you choose a 6 or 8, you will win 5 to 6 odds while 5 or 9 pays 2 to 3 and 4 or 10 pays 1 to 2. Considered sucker bets, the Big 6 and Big 8 are bets you want to avoid. The ideal craps strategy will always say avoid these bets. A Big 6 bet will pay if a 6 is thrown before a 7. The Big 8 is paid when an 8 is rolled before a 7. When the dice are thrown in craps and the roll is a double, it is known as having been thrown the hard way. A hard 8 would be a double 4. On this bet, you are basically wagering on doubles. You can choose a hard 4, hard 6, hard 8 or hard 10. If the number is rolled before a 7, then you win. Choose a 4 or 10 and you earn a 7 to 1 payout on a win. Choose 6 or 8 and you will earn a 9 to 1 payout. With a field bet, the wager is settled on the next roll. This bet wins if a 2, 3, 4, 9, 10, 11 or 12 is rolled. The bet is lost if the next roll is a 5, 6, 7 or 8. The bet pays 1 to 1 unless a 2 or 12 is rolled. If these two numbers rolled, then the player is paid 2 to 1. In craps, there are several proposition bets one can make. Each of these bets are settled on the next roll. With prop bets, the house edge is higher, but the payout is also higher. Now that if you take a prop bet, you are risking your bankroll. A prop bet known as any 7 will pay 4 to 1 if the next roll is a 7. Any 11 will pay 15 to 1 if the next roll is an 11. Any craps is a bet that is won if a 2, 3 or 12 is rolled next, paying 7 to 1. Ace Deuce will pay 15 to 1 if the next roll is a 3. Aces will pay out a whopping 30 to 1 if the next roll is a 2. Boxcar will also payout 30 to 1 if the next roll is a 12. 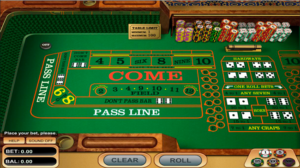 Online craps (or land-based) is a game that can be played with a low house edge. While the game can be in the player’s favor, there are sucker bets that most everyone seems to fall for. Betting the wrong way without a proper craps strategy can leave you with a lower bankroll. By learning more about craps casino strategy, you can use various bets to your benefit. Be sure to understand the rules of the game fully and learn more about each bet type so that you can make the best decision while playing, be it online or in land-based form. The best craps strategy is making smart bets. Top bets include the Pass/Don’t Pass bet and the Come/Don’t-Come bet. If you stick to these betting options, the house will only have an advantage of around 1.40%. You have the best chance of winning with these bets and hopefully, continue to build your bankroll. A good craps winning strategy is to avoid the sucker bets. Betting the Big 6 or Big 8 wagers will most likely end in a loss for you. These bets put the house advantage at 9.09%, with a payout of just 1 to 1, not beneficial for the player. Some gambling players of brick and mortar casinos believe they can get an edge over the house using “dice control” techniques. The craps strategy used is that setting the dice in their hands in a certain way, they can learn to minimize the number of times the dice land on losing results, which increases the chances of winning, especially on the lower house edge bets. However, if casinos thought this was actually possible in real life, you’d see all kinds of preventive measures taking place to avoid losing money. It may be possible that dice control in craps is so rare or so new that the casinos just haven’t caught on it yet, but if we take the casinos’ reactions to card counting when it first rolled out, it’s unlikely that they would turn a blind eye to something like this. Playing online craps is a great way to enjoy the game without having to travel, plus your strategy can be applied no matter where you play the game. Below are a few tips and tricks to get you started. Set a loss limit for yourself. Playing at home is much easier than playing at a casino and you can easily get caught up in wagering and lose more than you bargained for. The best online craps strategy starts with a betting limit. If you set a $300 limit, then stick to it! Take the pass line and come bet. Going for these wagers will see you enjoying the game with the house having only a 1.41% edge. These are the best wagers you can place to lose the least when playing the game. The game of online craps actually offers the lowest house advantage when it comes to any casino game. However, there are wagers you can place that have a higher house edge. Avoid the Big 6 and Big 8 bets as they have a house edge of 9.1%. Stick with the bets with a lower house edge to have the advantage. When playing online, you want to choose a top-rated casino. This is a big consideration that must be made for your gaming to be successful. Choose a licensed online casino available in your region so that you can access the best online craps games and have the ability to cash out your winnings quickly! When it comes to online craps, you want to find a casino that is well-respected, offers quality banking methods and bonuses. Our two top picks are Betway Casino and BetOnline Casino. Read more about online craps and these two casinos below. Online craps can be played at Betway Casino with access to quality bonuses and promotions as well as other table games. The craps game at Betway is player-friendly and easy to play. 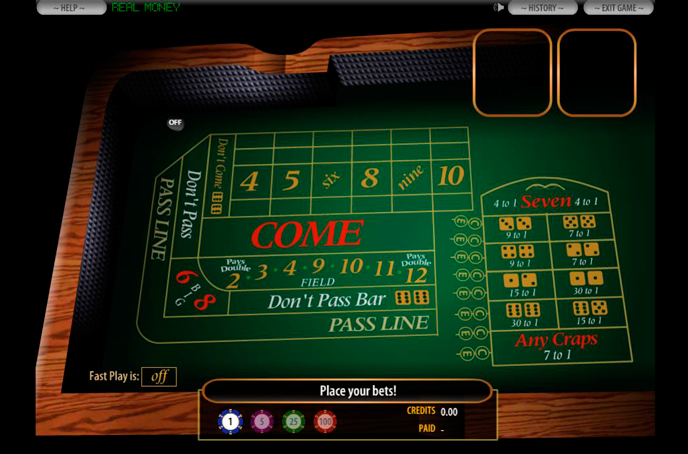 The graphics show the game as it would appear in a casino setting, allowing players to easily place their bets and get started enjoying the game. The Welcome Bonus at Betway is a perfect way to get started building a solid bankroll. players will earn 100% cash back on the first deposit up to £250, then the second deposit provides 25% match up to £250 and the third deposit is a 50% match worth up to £500. Craps is excluded from helping to clear this bonus but can be played at any time. When you are ready to cash out, the online casino offers only the best banking methods. Easily cash out your winnings via providers such as Visa, Neteller, PayPal and more. At BetOnline, craps online players will have access to two craps games in the standard casino. Players can wager up to $250 per play, making the game perfect for beginners or high rollers. Playing online craps here provides players with quality graphics and sounds, similar to those experienced in live gameplay. When joining BetOnline for the first time, players will have access to a quality welcome bonus. On the first three deposits, add $25 to $1,000 to your account and see a 100% match from the online casino. Players must play through the bonus plus deposit amount 40X before any winnings can be withdrawn. The bonus cannot be cleared with craps but can be cleared with other games. To make a deposit or withdrawal at the site, use such methods as bitcoin, credit card and more.